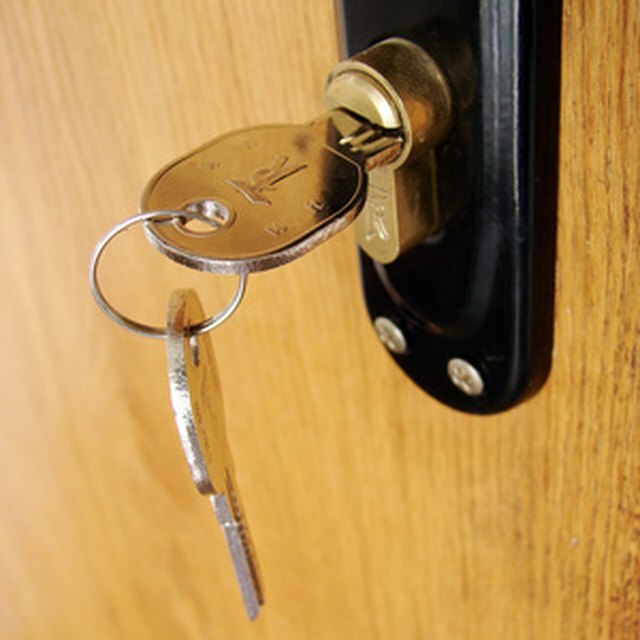 Suffolk door latches have a simple lever that locks and unlocks a door. They give a period look to a gate, shed or door, and are easy to use and install. As long as you're careful not to scratch the finish as you install the latch, the process won't take more than an hour with a power drill and tape measure to help you along. Measure the height at which you want to install the latch. Personal preference factors in here. Most door handles are placed 36 inches above floor level. Drill a hole 1 1/4 inches wide at the height you measured. The center of this hole should be about 2 inches from the edge of the door. The thumb lever will go through this hole, and needs to be large enough to allow the lever to move up and down. If you have a particularly large lever, make the hole bigger. Insert the thumb lever into the hole. Lay the latch over the lever. Make sure about 2 inches of the latch passes over the door, the gap between the door and the door frame and onto the frame itself. Hold a level over the panel that holds the screws. Make sure it's horizontal, then pencil in where the screws will go. Drill in the screws that hold the latch to the door. The latch should rest on top of the thumb lever. Slide the keep under the latch on the door frame. Drill in the keep to the door frame when the latch is level and snug in the keep. Make sure the keep isn't crooked on the door frame. Fit the jump staple over the door latch. Place it between the door frame gap and the thumb lever. Make sure it's not crooked when you drill it into the door.